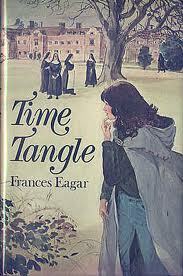 Time Tangle, by Frances Eager, was published way back in 1976, and if I had gotten hold of it back then (when I was eight) I would have loved it to pieces. Alas, as an adult reader I couldn't quite feel the love--it just didn't go far enough with the magic of its time travel premise to make it wonderful. Beth is a girl at a boarding school run by nuns in England, whose mother died a few months before the book begins--she is full of (mostly) repressed, and totally understandable, grief, and spends most of her time indulging in extravagant daydreams, which she narrates to herself. Her journalist father was supposed to come back to England to spend Christmas, but he can't. So Beth is going to stay with the nuns, crossing over to their side of the campus, an old manor house (unknown and exciting territory!). She doesn't mind, exactly; though she misses her father, Christmas without her mother was going to be horrible regardless. One day Beth, wandering the cold woods outside the school, dressed up in her Elizabethan costume from the school play (which strikes me as a sensible thing to do, if you are going to wander around imagining things), and singing Greensleeves to pass the time (as one does), meets a boy named Adam. Turns out, Adam is an actual Elizabethan, who's gotten involved with the Catholic priest underground. And he shares with Elizabeth the information that a Catholic priest hidden in the manor house, and she agrees that she will be the next link in the chain of messengers, and warn him that he must not go to the next house on his itinerary, where he will be captured. But though Adam can come and go through time (he seems to be visiting the present), Elizabeth, with exception of one vision of the Elizabethan past, cannot. And though she tries to twist the heavily painted-over Tudor rose that opens the hidden priest hole, she cannot...and the chain of warning is broken. So its a fine story, with lots of bonus points for interesting and sympathetic nuns running a school (not something you see much of, and I've always liked a. boarding schools and b. In This House of Brede, by Rumer Godden, which is the best book about nuns ever), and Elizabeth is a girl who reminds me of me (not the dead mother part, but the narrated imaginings part), and that is just fine, and Adam is enigmatic and appealing, and the tension is great. But the ending fizzles, and Adam doesn't get enough page time. Fifty or so more pages, with more time travelling, and I probably would like it lots more, but as it was the balance was off. The two stories-- Beth's life in the real world, and Adam's problems in the past-- seemed to be two separate pieces of bread (unobjectionable bread) with no tasty sandwich filling making them into a glorious whole. Short answer: if you see this in a library booksale for 25 cents, go for it. If you have an imaginative and introspective book-loving girl around your house who is eight or nine years old, you could even look for it activly. Note on ghost vs time travel: I am categorizing this as time slip rather than ghost, because Adam is still very much within his own time, objects from the past are solid, and Elizabeth at one point sees backward into the past. But I did get a sense of the author being reluctant to fully commit herself to one or the other, and this, now that I come to type it, may be the root of my dissatisfaction. It's so sad when I find a book as an adult that I would have *loved* as a kid but doesn't work for adult me. It's especially sad because I was so hungry for books back then!